I didn’t want to go to hospital. My big sister said, ‘My hippo knows all about hospitals. 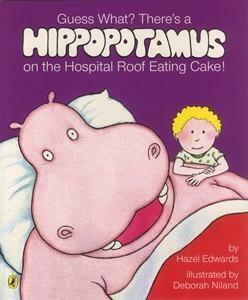 He can go with you.’ There’s a hippopotamus on our roof eating cake. And he’s going to hospital too. Everybody’s favourite hippopotamus is back in a wonderful new picture book sure to delight old and new fans of the cake-eating hippo. This much-loved and best-selling series has sold worldwide and been translated into several languages.